There is a ship in the heart of the Destin Harbor where ordinary people can become pirates, and climbing aboard is the key to unlocking the treasure of your heart. 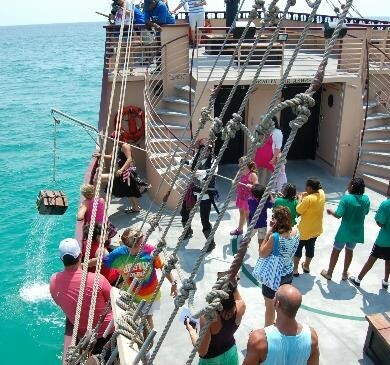 The Buccaneer, sister ship to the popular Southern Star dolphin cruise, first plundered these friendly waters in the year 2012 – and has been commissioning new pirates ever since. The experience was a long time coming, says Nicole Remele, office manager for both the Buccaneer and the Southern Star. From the moment your toes touch the deck, you’ll be immersed in a world of wonder, where pirates like Captain Cannonball, Gypsy Princess Rose Marie and Quartermaster Kirby Jake Scarborough will take you on a trip to discover the true meaning of treasure. We recommend you sit on the main deck if you want to be near your little scamps. Most of the action takes place here – and there is a lot of action, so be sure to bring your camera. Both kids and adults are encouraged to dress the part. But if you didn’t pack a pirate hat, you can find reasonably priced toppers and plastic weapons in the galley gift shop. This is also where snacks and drinks are available for purchase, including grog (beer, wine and mixed drinks) for legal landlubbers. The Buccaneer’s scallywag crew are the real deal, teaching your little lads and lassies to wield swords and water guns, swab the deck, lift loot from the sea and more – entertaining children and their parents from the first minute to the very last. Along the way, they’ll share bits of guidance and wisdom, like the importance of perseverance, patience and teamwork. “We encourage participation from kids as well as parents, but if the adults just feel like kicking back, your children will be captivated the entire time,” says Remele. The show aboard this pirate ship echoes the best family movies, with delights a-plenty for the wee ones and cleverly masked jokes for the Moms and Dads. Yet in the midst of all the fun and games, you’ll find deeper meaning. When Kirby Jake leads the boisterous buccaneers into the heart of the ship, the heart of this seafaring story shines through. In the end, you’ll listen as the children recite a pirate oath. Among their promises are to ‘be a leader’ and ‘do good in the world wherever they can.’ The Buccaneer is certainly making good on that vow – doing good by every mate who dares to step aboard. Unlock the treasure of your heart by booking your cruise on the Buccaneer today. Visit the Buccaneer Pirate Cruise website or call (850) 269-0896 for more information.